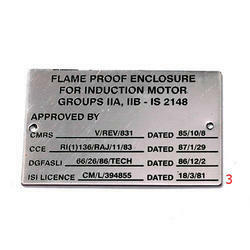 We are engaged in offering Stainless Steel Etched Label. We offer our services as per the need and requirement of our valuable customers. We serve our best to our clients. We offer a qualitative range of Stainless Steel Etched Label and aluminum etched labels that are commonly used for outdoor applications. These are widely demanded owing to their non corrosion properties thus ensuring long service life. Our range of labels are made using superior colors and quality SS having life of upto 4-5 years.